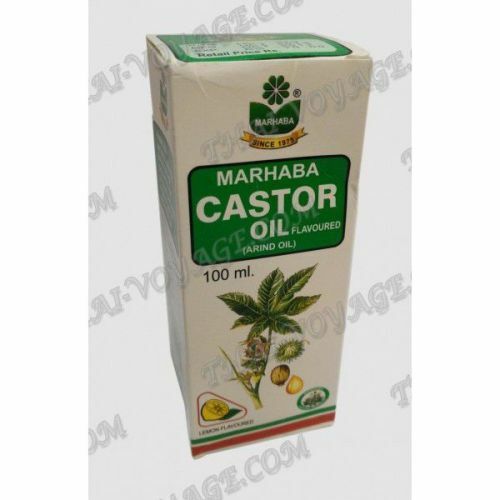 Worldwide castor oil is used as a means of almost all diseases. Today, castor oil is a natural protection against many serious diseases and fatal virus. Currently, castor oil is often used to detoxify the body, intestinal cleansing or diet before. Many doctors and herbalists believe that diseases such as multiple sclerosis, Alzheimer's disease, glaucoma arise due to the accumulation in the body of heavy metals, toxins, from which you need time to get rid of. Toxins, bad ecology weaken the immune system, affect the overall condition of the body. Slagging lead to digestive problems, allergy symptoms. To begin with, always cleaned intestines. The laxative effect of castor oil helps to get rid of the remnants, eliminate constipation, which is especially harmful to the intestines. Indian castor oil harmless, mild natural laxative, cleanses the body, removes dirt and toxins from the stomach and intestines. - For a laxative and cleansing effect it is recommended to an adult about 15-30 ml of oil. To avoid nausea, oil is best taken on an empty stomach in the morning. After a while, you can drink juice, tea, eat vegetarian food during the day. Europeans are recommended for bowel cleansing drink on an empty stomach emulsion (castor oil + milk 100 gr.) For nausea, disgust is recommended to chew a piece of ginger. Recommendations: before oil bowel cleansing is recommended 2-3 days to stick vegetable diet, or 1-2 days of fasting. - Can be cleaned intestine special emulsion with castor oil. Mix 3 tablespoons of castor oil with 1 tablespoon of false maple syrup, add 50 ml water and intensively mixed for 3 minutes. This emulsion should drink immediately after preparation, in the morning on an empty stomach. Instead of maple syrup you can use liquid honey, pear juice. - In acute constipation it is recommended to take (5-10 oz.) Of pure castor oil on an empty stomach. The effect is manifested through 2-4 hours. A single dose. The use of castor oil (a daily dose of 4-6 oz.) Can last from one to five days. Contraindications: Do not use castor oil if you have gastrointestinal disorders, bowel obstruction, appendicitis, inflammatory bowel disease, abdominal pain of unknown origin. In addition, pregnant women, lactating women and children under the age of 12 years before using the oil, should consult a physician. Also, gallstones, colitis, thyroid disease, taking antihistamines. In all these cases, there may occur drastic side effects. In practice, should be used with caution in castor oil.